The other day I talked about the virtues of being a cheapskate. Today I want to talk about how to actually be a cheapskate… even if you hate the idea of haggling. Now, it’s no secret that you can dicker for a better deal on a car. Buyers have been doing that going back to at least 1926 when the first Kelly Blue Book came out. The publication gives you a dealer’s best price before you walk into the showroom. Edmunds is another site with an online tool for first-time new-car buyers. It’s meant to arm you with everything you need to get a sweet deal on a new car. And a lot of people are at least fairly comfortable with the idea of haggling over car prices. These are generally small businesses. So you’re bound to be talking with the owner. Tell them that you’re getting several bids. The lowest price isn’t necessarily the best option. But you’ll get the point across that they better be competitive if they want your work. The same for yard upkeep. Suppose they refuse to negotiate on price? Then ask to add in an extra service, such as weeding the flowerbeds. And if you have a neighbor who’s looking to have similar work done, you might have another bargaining chip to use. You should also consider other ways to lower costs. For example, cutting the grass every ten days rather than every seven will slightly lower the price. Also think about materials and other choices when it comes to bigger projects. I know several friends who spent $50,000+ just on kitchen cabinets. Meanwhile, I’m about to do my second kitchen remodel with Ikea cabinets. First, I purchased several thousand dollars in gift cards at discounted rates during the company’s Black Friday sale. Then, I waited for one of its semi-annual kitchen sales where you get back 15% of every dollar you spend and used the gift cards at that time. Add it all up and I got roughly 35% off the already-reasonable prices… just by planning ahead. If you have medical insurance, the company has already negotiated special rates. But if you’re uninsured or haven’t hit your deductible yet, you could be facing huge expenses. And dental work is rarely completely covered by insurance. Not sure how much you should offer? The Healthcare Bluebook lists the fair price for procedures, including dental, in your area. For elective surgery, the cost can vary a lot. The same for dental. Then go back to a doc you really want and present the price you’re willing to pay. Already run up a big bill? Make an offer before it goes to collection. The reality is that doctors are frequently stuck with patients who don’t pay. So they’d rather get something than nothing. If you’re paying by the hour ask if the preparation work is at a lower rate than court appearances. Attorneys charge higher rates when they have to pay experts for your case. Offer to pay those experts yourself for a reduced hourly rate. And if you’re hiring a lawyer on a contingency basis, he’ll probably want 33% to 40% of your award. Offer a smaller piece of the pie or at least get him down to the lower end of the percentage range. I’ve written an entire article on this before because prices vary widely among carriers. Your profession, the age of your car, where you park your car, your credit score, are potential negotiating points worthy of a discount. And if you tell your existing carrier that you’re shopping around, they might cut your premium since you’re a loyal customer. After all it’s cheaper to keep a current customer than get a new one. Shop around for home insurance, too. And remember that bundling different types of coverage together can save you even more money. If you’ve been a long-term customer, demand a price break or you’ll move to another provider. If they won’t budge, call later and ask someone else. Are they offering teaser rates for new customers? Tell them you want that rate. The same for subscriptions to newspapers, magazines, gyms. Calling to cancel might get you discount or several months free. And obviously these days it’s a lot easier to go without some subscriptions entirely! For example, we don’t have full cable at my house and haven’t for at least a decade. We use a combination of one-off subscriptions, Amazon prime, Netflix, and other methods to only pay for the shows and programming we really want to watch. You’ll have better success haggling with an independent store than a big-box retailer. Floor models often have small defects, like scratches. So if that doesn’t bother you, offer 50% off the listed price. Put together a package of multiple items if that saves you money. See if paying cash gets you a deeper discount. Ask for free shipping. Or offer to pick up the items instead of using the store’s delivery service for a discount. And as I’ve said before, there’s plenty of great used furniture out there on Craigslist and through other sources. I’ve grabbed some terrific pieces other people were leaving out on their curbs. I also recently built an entire outdoor dining set from a discarded pallet and a few pieces of lumber from the local hardware store! Again, your odds for negotiating are greater when you avoid the big national brand shops and head to a mom-and-pop store. Make an offer on the showcase item or something that has been in the store for some time. Politely make a reasonable offer. Walk if they refuse. You might be surprised when someone chases after you to discuss it further. And here’s one other trick I used personally when I bought my wife an expensive pair of one-of-a-kind earrings from Barney’s in New York for our tenth wedding anniversary. Since stuff like that almost never goes on sale, I bought discounted gift cards through a website called CardCash. Then I used the cards to buy the earrings. I saved several hundred dollars in the process! Planning to rent a private home for your vacation? See how much other rentals are going for in the area. Then contact the owner and make a reasonable offer. Airbnb has become a popular resource to compare prices. And once you’ve found the home you want, it’s easy to contact the host to negotiate a lower price. Your chances of getting a deal could be even better if you’re going during the off season. And even if you’re staying at a mainstream hotel, it doesn’t hurt to give them a call to bargain for a better rate. You can negotiate online via Facebook, Twitter, or a company’s chat box. Overall, the Internet is packed full of negotiating opportunities for furniture, electronics, clothing, and a whole lot more! Consumer Reports did a survey and found that 69% of online shoppers who tried for a better price on a TV, computer, or other electronic doodad got a price break. That was better than the 59% success rate of in-store shoppers. Also worth noting: Online negotiators pocketed an average discount of $94 while in-store buyers received $84. And if you can’t get a better price, all is not lost. Ask them to throw in an extended warranty, free shipping, or other perk to seal a deal. Many retailers will also match competitors’ online prices. You just have to show them the price using a smartphone or printout. Log into the company’s website. Put the product you want in the shopping cart and don’t checkout. 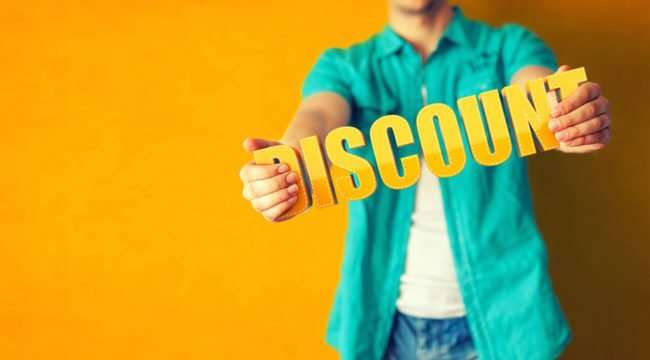 In some cases, you’ll see an on-page discount offer in the car! Or you may start receiving follow-up e-mails offering discounts on that particular item in your e-mail inbox. At the end of the day, the range of what you can negotiate is almost unlimited… auto repairs, mortgage fees, funerals, website designs… you name it. And there’s no reason to feel ashamed about it.